Summary: A breakout novel from an author who “positively shines with wisdom and intelligence” (Jonathan Tropper, This Is Where I leave You). “Laura Dave writes with humor and insight about relationships in all their complexity, whether she's describing siblings or fiancés or a couple long-married. Eight Hundred Grapes is a captivating story about the power of family, the limitations of love, and what becomes of a life’s work” (J. Courtney Sullivan, Maine). Over the years, I've really come to appreciate Laura Dave's novels; and her latest is another good one! It's called EIGHT HUNDRED GRAPES and tells the story of a daughter of a winemaker and her family. Not only did I enjoy ready about this extremely special family, but I also learned a thing or two about winemaking. Did you know that it takes 800 grapes to make one bottle of wine? EIGHT HUNDRED GRAPES tells the story of Georgia Ford. She seemingly has it all -- a loving family, a great career in Los Angeles, and a terrific fiancé However, a week before her wedding, Georgia discovers that her fiancé has been keen keeping a huge secret! Rather than trying to work through this issue, Georgia runs home to her family's vineyard hoping to find some comfort. What awaits her is far from comforting. Her parents long-time marriage seems to be unraveling, her twin brothers are in love with the same woman, and her father wants to sell the vineyard. Georgia tries to make sense of the chaos that is now surrounding her. She if forced to examine her own relationships and accept the faults and desires of others. In many ways, it's a coming-of-age story for Georgia... and you know how I love a good coming-of-age story! EIGHT HUNDRED GRAPES was most definitely a great read for me. I tend to enjoy stories about complicated families, and the Ford family fit the bill. Having said that, this novel was also really well executed. I loved how the author incorporated so much about winemaking into the novel while also showing the similarities between making wine and living life. Another wonderful thing about EIGHT HUNDRED GRAPES was the setting. One of my dreams is to visit Northern California and tour vineyards, so I was in seventh heaven reading about this part of the country. It's apparent that Ms. Dave did her research on wine-making, and her descriptions of the land and the wine-making process itself seemed authentic. In addition, Ms. Dave's writing is just so polished. That wasn't a surprise for me because I have enjoyed a few of her other novels, but I thought she did an excellent job of telling this story. I liked how she used flashbacks to bring the reader up-to-date on how the members of the Ford family got themselves into these situations. I also really appreciated how she showed the various characters' viewpoints. It allowed me to understand them better while also feeling some compassion towards them... even when it seemed like they were at fault! And finally, I really loved how I got caught up in the lives of the Ford family. There is no doubt that these characters were intriguing, but I was a bit surprised by how much I ended up caring about them. This book tugged on my emotional heartstrings, and I think that's a credit to how well developed the characters were. EIGHT HUNDRED GRAPES would make an excellent book club selection. There is a reading guide available with thirteen discussion questions as well as some ideas for enhancing your book club meeting. Some of the themes you might want to explore include family, marriage, fate, synchronization, sibling rivalry, forgiveness, regrets, and love. It also would be interesting to discuss the various characters' relationships and actions with each other. And I probably don't need to mention this, but... a wine tasting at the meeting would be an absolutely perfect tie-in to the novel. Here are some wine pairing recommendations. In addition, there is a great promotion going on. The publisher is running a sweepstakes for a chance to win a visit from Ms. Dave herself, as well as a gift card to Harry & David (Ms. Dave will visit 1 book club in NYC—Manhattan and Brooklyn only—1 book club in Los Angeles, and will Skype with 1 book club located anywhere in the U.S.)! To enter, you must post a message on Twitter about EIGHT HUNDRED GRAPES using the hashtags #EightHundredGraps and #entry, and fill out the sweepstakes form. 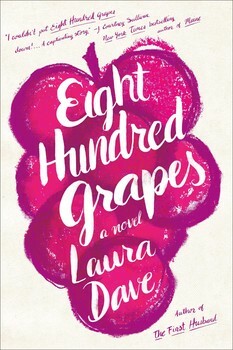 I really, really liked EIGHT HUNDRED GRAPES. I highly recommend it for fans of stories about dysfunctional families! I loved the winemaking aspect of this book - it added a great touch to the story. This sounds really good. Complicated family, some big secrets AND wine pairings?! Yes, please. Thanks for the thoughtful review.